Some would argue that the oak leaf is an intrinsic part of British culture, as familiar to you and I as a pot of tea or David Attenborough’s voice. Did you know that we are the largest voluntary conservation charity in Europe? Our moto is to protect areas of historical and ecological value for ever, for everyone. It is this need and duty to protect these fragile and irreplaceable sites which drives us forward, choosing new sites, pioneering new schemes and continuing to maintain our properties. Membership, donations and the indomitable tea rooms all help to finance and support these efforts. However we are the largest voluntary conservation charity, the very foundation of the National Trust is built upon the loyalty and dedication of our volunteer army. It is easy to see the National Trust as one vast charitable machine but in reality it consists of pockets of land and property, each needing its own individual regime of care and attention. Here in the Surrey Hills we are lucky to be surrounded by many such pockets, in fact just down the road is Box Hill, a beautiful and fragile mosaic of grassland and woodland. Hundreds of visitors walk, drive or cycle the world famous Zig Zag every day to take in the stunning sites and scenery that Box Hill has to offer. Box Hill has its own volunteer regiment at whose feet this beauty can be laid. 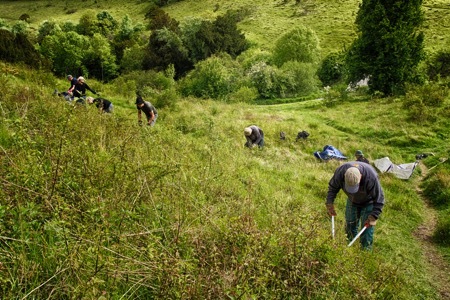 Every Wednesday and every Thursday come rain or shine, our volunteers help restore and conserve Box Hill, for both ecological reasons and for you the public to enjoy. We are always looking to expand and add to our teams, with local people, who care about nature, and who have a sense of ownership and pride at having access to Box Hill. All ages and genders are welcome, whether you are working or retired, an athlete or a dog walker, there is a space for you in our team. We need people to help keep Box Hill beautiful, the more people we have the more we can do, the bigger the projects we can embark on and the more events we can host. The more that we as a community put in, the more that we’ll get back. The National Trust needs volunteers, the National Trust needs you! If you’d like to get involved, ask for more information, or even just have a chat please contact David Benjamins Box hill Ranger.